Cloud storage services have been around for awhile and are a great way to make your files accessible no matter where you’re located. Among my favorites is Dropbox because it goes beyond simply making your files available to you from any location. Dropbox allows you to share files and folders with others (with your permission, of course!). So, rather than just being able to access your files, you can use it as a place to share documents with co-workers, store and retrieve documents for students, and share photos with your family and friends. Dropbox can integrate with your other files and folders, appearing right alongside them. And that’s fine. Google Docs is still a better solution if you’re looking to do synchronous collaboration on a report or presentation, but Dropbox can function just like a folder on your computer, making it more integrated into the workflows to which you’re already accustomed. It might be possible that your organization has a networked drive or intranet that you use for sharing files (we have both here at Towson). These are both reasonable solutions to this, but both can be difficult if you need to access something at home, as many block access from off-campus. This also causes issues if you’re collaborating and sharing files with someone outside your organization. You might also run into storage and file size limitations with both of these solutions. Dropbox does have a limit of 2GB for free accounts (a subscription can get you up to 100GB). Our entire network drive is 10GB so 2GB for your own use is not so bad. Getting a Dropbox account is easy, as is installing it on your computer. (There’s also a web interface for computers on which you can’t install or haven’t installed it.) To create an account, click the Login option in the upper-right corner and choose ‘Create an account’. Enter your info and voila! Click 'Login' and then 'Create an account' to setup your account. 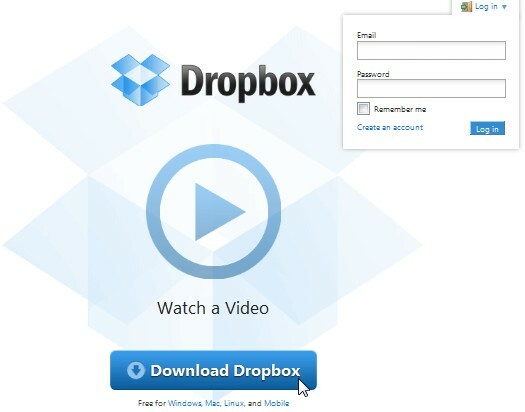 Click the 'Download Dropbox' button to install it on your computer. Click the ‘Download Dropbox’ button to install the Dropbox folder on your computer. (You’ll need admin permissions for this.) This will download the install file to your computer. Double-click the file to start the install process. Dropbox will ask you where you would like the folder to be located (e.g. on your desktop, inside another folder, etc.). Once everything is installed, you’ll notice the Dropbox folder (at whatever location you assigned it) and an icon in your taskbar. Both of these will give you access to a variety of Dropbox functions. 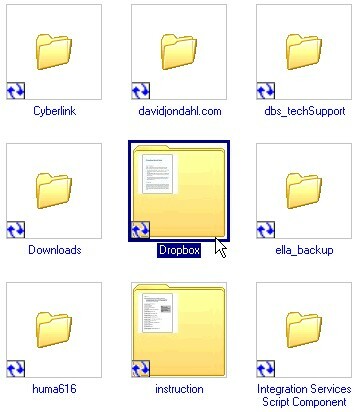 Several Dropbox functions can be accessed from the taskbar icon. The taskbar icon provides a shortcut to your Dropbox folder (either on your computer or on their website), a menu of recently changed files, and options to change your preferences, including moving the Dropbox folder to a new location. Right-clicking on files and folders within the Dropbox folder will bring up your usual menu of options with the addition of a Dropbox option. From here, you can manage the sharing permissions of individual files. For any files that are in your ‘Public’ folder, you can also get a URL, which you can send to those who aren’t privy to the wonderful world of Dropbox. What do I use it for, you ask? I have two primary uses for Dropbox at the moment. First, as a person who constantly finds myself working at home (not recommended), I often use Remote Desktop to access my work computer. This is great, but there are times that I really need my work files on my home computer to print them or listen to them, etc. I used to email these to myself, which was a hassle and unnecessarily clutter my Inbox. Now I simply drag the needed file to Dropbox on my work computer and (almost) instantly have access to it on my home computer. Second, I am currently serving on two work groups with members outside my organization that require files to be shared. We’re not collaborating on any documents necessarily, but a certain amount of file sharing is needed. One group is sharing video recordings, PowerPoint slides, and PDF reports. The reports and slides contain links to the video recordings. (One of the nice things about using the Dropbox folder is that your file structure stays in tact, so links to other content in the folder should still work.) The other group is dispersing several Word documents amongst members of the group to facilitate a peer review process. The group coordinators have access to all files and the reviewers see only those files that they are reviewing. I’ve also used this occasionally to gather content from clients and family for whom I do website development. If you ever find yourself in a situation where you’re emailing large files back and forth to someone, Dropbox can help you keep your Inbox clean and prevent potential confusion over the newest version of a file. I’m sure that many other uses for Dropbox exist, and I’d love to hear how you’re using it (or would like to use it). What other cloud storage services are you using, and how do they stack up to Dropbox?